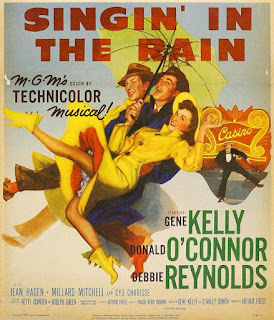 The joyous film, co-directed by Stanley Donen and acrobatic dancer-star-choreographer Gene Kelly, is a charming, up-beat, graceful and thoroughly enjoyable experience with great songs, lots of flashbacks, wonderful dances (including the spectacular Broadway Melody Ballet with leggy guest star Cyd Charisse), casting and story. This was another extraordinary example of the organic, 'integrated musical' in which the story's characters naturally express their emotions in the midst of their lives. Song and dance replace the dialogue, usually during moments of high spirits or passionate romance. And over half of the film - a 'let's put on a play' type of film, is composed of musical numbers. Because the colorful, witty film is set in 1927, it humorously satirizes and parodies the panic surrounding the troubling transitional period from silents to talkies in the dream factory of Hollywood of the late 1920s as the sound revolution swept through. The film's screenplay, suggested by the song Singin' in the Rain that was written by Freed and Brown, was scripted by Betty Comden and Adolph Green (who also wrote On the Town (1949)). The time frame of Comden's and Green's script, the Roaring 20s Era of flappers, was mostly determined by the fact that lyricist Freed (and songwriter Nacio Herb Brown) had written their extensive library of songs in their early careers during the 1920s and 1930s, when Hollywood was transitioning to talkies. The musical comedy's story, then, would be best suited around that theme. 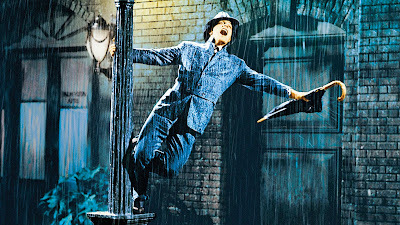 Except for two songs, all of the musical arrangements in the film to be showcased were composed by Freed and Brown for different Hollywood films before Freed became a producer.